The fox killed all of our neighbour's hens, taking only the one bird back with it. Urban foxes must be utterly delighted by the spread of urban chicken keeping and they have no mercy. They kill for fun as well as food, they have no control as soon as they have some prey. However angry I was about the threat to my little chucks, it is entirely due to that horrible sound of an animal in terror and pain that I remain staunchly anti-hunting. If I had found that fox in my chicken run, I would have fought it without hesitation, but people don't need to be doing that for fun. Take up stamp collecting instead. Back to the image. I am torn as to how I feel about it. Part of the scene stirs enormous nostalgia in me because such pictures graced the walls and tablemats of countless great-aunts, grandparents and elderly relatives as I grew up. Much like the stagecoach, it feels very much like a scene of the past. I often find that awful practices in the past tend to lose their impact somehow. Maybe we forgive our ancestors their 'follies' as we feel they didn't know better, but I am reluctant to think of our past-selves as idiots or children. It is true that things had a different resonance. With a suitable detachment from the original purpose things lose their vital impact, but also should be recognised as unacceptable in modern society. 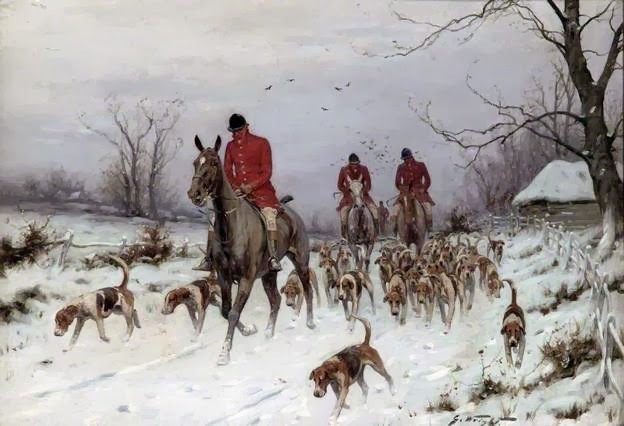 The red of the coats of the hunters is beautiful in the snow. I wonder if that is the reason that red is so often the colour of winter, because it has such life-affirming vibrancy. Think of the holly berries, cranberries, red cabbage and the multitude of other sparking jewels that bring a richness against the icy backdrop. 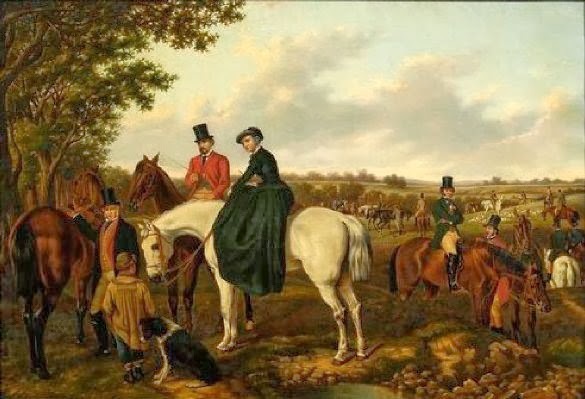 Images of women foxhunting are interesting as they are borderline eroticised. Women on horseback were often fetishised due to the odd combination of tight lacing and physical exertion. Add a bit of jolly blood sport into the mix and I think your average Victorian gentleman came over a bit unnecessary. Best to stick with gentlemen on horseback. It doesn't inflame anyone's ardour apparently. Well, this has been a tricky one but I wanted to talk about it. In a way I'm sorry that the last government made foxhunting illegal as it immediately made any sensible discussion of it impossible. It became a pivotal issue in the otherwise legitimate dispute between town versus country rather than what it is - an incomprehensible, cruel excuse of a hobby best relegated to our past. I come from a 'farming' family where foxhunting was seen as necessary, but also enjoyable sport. I grew up hating animal cruelty of any kind, whether classed as 'sport' or not. It may be a sentimental view, but I think we are and will be judged on how we treat animals and around the world, the cruelty is just appalling. I decided to become a vegetarian so that I would feel I was doing something, albeit in a small way. However, if foxes were attacking my chickens, I rather suspect I would want to protect the chickens! Thank you for talking about this - I agree that it is something that we can't discuss sensibly now. I have never understood fox hunting. If the foxes are that much of a pest, why didn't they just shoot them? That's a lot cleaner and doesn't involve terrorising the poor creature and it getting mauled by dogs. I don't see why anyone would want to go charging about the countryside on horseback after a fox with a pack of hounds. If it's chasing things on horseback that's fun, then they take up drag-hunting where you're chasing a cross-country runner! It's not very efficient and I grew up where hunts would ride through back gardens and school playgrounds. Oddness abounds.